GENESEO, N.Y. – A SUNY Geneseo student has received a national Barry M. Goldwater Scholarship for her achievement and potential in the field of chemistry. 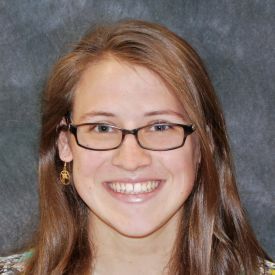 Carrie Levinn, a junior from Averill Park, N.Y., received one of 271 scholarships that the Goldwater Scholarship and Excellence in Education Foundation awarded to undergraduate sophomores and juniors from the United States for the 2013-14 academic year. The students were selected on academic merit from a field of 1,107 mathematics, science and engineering students nominated by the faculties of colleges and universities nationwide. The award covers the cost of tuition, fees, books, room and board to a maximum of $7,500 per year. It’s the third consecutive year that a Geneseo student has received a Goldwater Scholarship and the 17th Geneseo student to receive the honor since the scholarship was established in 1992. Evan Losh, a physics/music double major from Fairport, N.Y., received a Goldwater Scholarship in 2012, and Ben Peterson, a biochemistry major from Nekoosa, Wisc., received one in 2011. Nine of Geneseo’s 17 Goldwater Scholarship winners are women. Levinn has been involved as an undergraduate researcher at Geneseo under the tutelage of David Johnson, professor and chair of the Department of Chemistry, and Eric Helms, assistant professor of chemistry. Levinn’s focus is bioorganic chemistry and the study of natural products. Her goal is to obtain a doctorate in chemistry and obtain a faculty position at a major university. Among other activities, Levinn is a member of the Golden Key Honor Society, Phi Eta Sigma Honor Society and Gamma Sigma Epsilon chemistry honor society. She also is president of the Geneseo Chemistry/Biochemistry Club and is captain of the indoor and outdoor track and field teams. In addition, she is an emergency medical technician (basic) for the Geneseo First Response emergency medical service team. The Goldwater Scholarship was established in 1986 in honor of the former U.S. Senator from Arizona. The goal is to provide a continuing source of highly qualified scientists, mathematicians and engineers by awarding scholarships to college students who intend to pursue careers in these fields.